Are online courses a good alternative to large lectures? This article argues that large lectures and online courses are complements more than they are substitutes. Students enjoy attending large lectures (provided teachers use motivating pedagogical methods) and having access to online courses. In particular, large lectures are an essential element of higher educational culture. Universities are increasingly diversifying course formats, and students now have access to thousands of online courses. Have these changes made the large lecture obsolete? Students still seem to be fond of large lectures. Some experiments suggest that even when students have access to an online course, they still enjoy attending lectures. For instance, at Sciences Po, some courses are filmed and available online for students to use when they want. And yet, course attendance remains particularly high. At the undergraduate level, more than 90% of the 600 students of the Paris campus assist to the majority of large lecture classes, despite the fact that attendance is not mandatory. At the University of Sydney, researchers surveyed students to understand why they continued to attend large lectures, even when these courses were available online (Gysbers et al, 2011). Of the 563 students in molecular biosciences who answered the survey, 74% were opposed to the suppression of large lectures. Students gave reasons that were both in favor of large lectures, and against online courses. Regarding the pros, students explained that they enjoyed the learning discipline that comes with being present in the lecture hall. Some students said that they attended class by habit, because they felt guilty not attending, and for financial reasons in a context where higher education can be expensive. 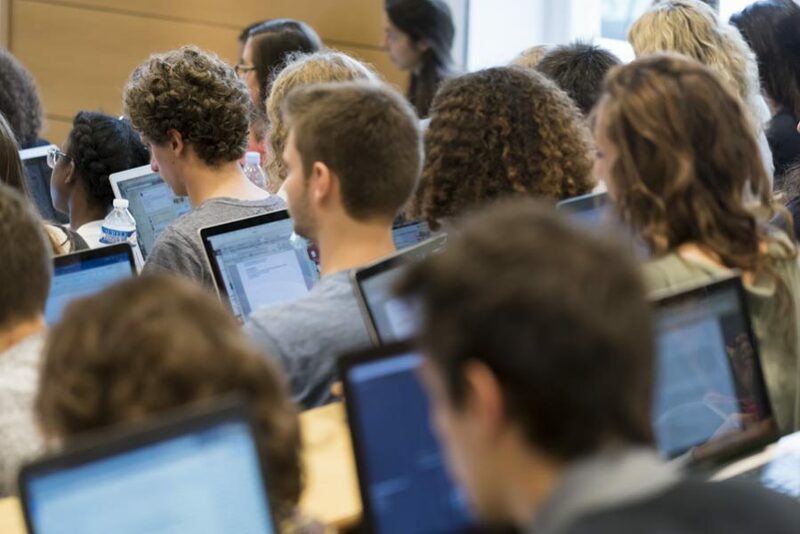 Compared to online courses, students who appreciate large lectures find that they encourage concentration in an environment that is conducive to learning. The fact that students are forced to sit during the length of each class is a constraint that students tend to appreciate. Furthermore, students like the fact that large lectures contribute to the “university experience”, and they enjoy the socialization that comes with this type of course. In contrast, students find that online courses can encourage procrastination. Always putting off to the next day the viewing of the course can make students lose an important learning rhythm : students are behind, and it becomes increasingly difficult to make-up for lost time as the semester goes by. Students appreciate a diversity of course formats. They more specifically enjoy having access to both large lectures that they can attend and online courses that they can watch in complement to the main lectures or for review purposes. Students like being able to watch specific moments of the lectures that they may have misunderstood for instance. Online courses allow more flexibility in students’ organization of work. For instance, they are particularly useful for students who exceptionally had to miss an actual lecture. Having access to the video of the lecture eliminates the problem of using someone else’s class notes to catch-up. In some universities where lectures are not available online, students complain that some of their fellow students’ class notes include mistakes or omissions. Two types of students in particular appreciate online courses: those who are very autonomous in their work methods, and those who are more used to digital tools. Students still seem to be attached to large lectures, especially when professors use appropriate pedagogical methods, for instance to keep students’ attention alive (we’ll discuss this issue in more depth in an upcoming article). Students perceive the large lecture as one of the most memorable experiences of higher education. Although smaller classes are important, diversifying course formats and still including large lectures is necessary. At Sciences Po, le largest lecture hall, named after Emile Boutmy, the founder of the Free School of Political Science (Sciences Po’s former name), is one of the most important places of the school. According to a survey by the association of Sciences Po alumni, 61% of former students say that this lecture hall is one of the places or symbols that are the most mythical of Sciences Po (it comes in second place, right after La Péniche, the entrance area of the historical campus, and heart of student life, mentioned by 66% of former students). The courses that are taught in the Emile Boutmy lecture hall as well as in other lecture halls remain crucial to Sciences Po’s students’ culture of higher education. Anne BORING, Assistant Professor of Economics, Erasmus University Rotterdam and research fellow, LIEPP and PRESAGE, Sciences Po. Gysbers, V., Johnston, J., Hancock, D., & Denyer, G. (2011). Why do students still bother coming to lectures, when everything is available online?. International Journal of Innovation in Science and Mathematics Education (formerly CAL-laborate International), 19(2).